Clarendon High School of Innovation would like to congratulate the following students for making the Honor Roll. These students had all A's and B's for the first semester. 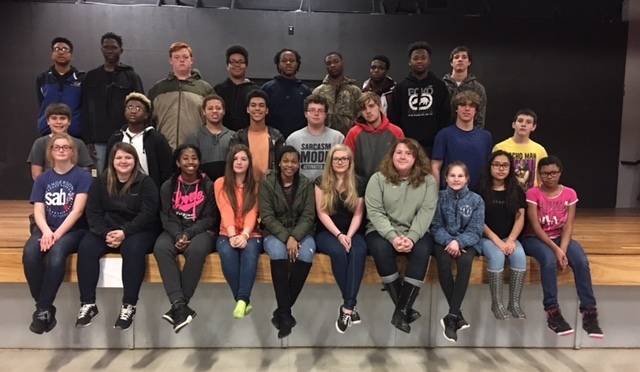 Pictured are (front roll from left) Kira Nichols, Megan Bailey, Trinity Scaife, Laci Johnson, Syan Tyler, Kasie Ward, Laura Loewer, Nickol Mason, Citlaly Flores, Talayah McClurge; (middle row from left) Braylon Hampton, Jaiden Meriman, Ethan Bundren, Tyrone Tolbert, Logan Johnson, Sebastian Feemster, Ethan Gibbs, Brian Warwick; (back row from left) Ashanti Tisdale, Kaleb Williams, Nick James, Jalen Cohen, Tyrus Thomas, Brandon Bonner, Tedryn Nunn, Lakeylon Stewart and Nathan Hood. Not pictured is Edgar Herrera.